The use of a timing device is to help you judge your pace whilst riding cross country but this will only come with experience and practice at that speed. Firstly your top priority needs to be on achieving a good balance, rhythm and obedience from your horse through the various gears needed to tackle different elements on the course. The terrain, topography, layout of the track and ground conditions will also have a huge impact on the speed that you ride and should come first and foremost over trying to get round inside the optimum time. Using a timing device should be part of your training and preparation by timing your faster galloping work. 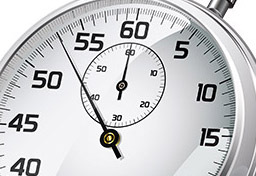 By understanding the distance that you are covering and timing it you can work out your metres per minute (mpm). 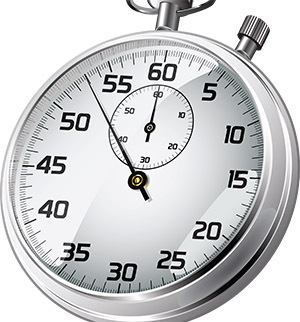 Whilst using a stop watch in competition it is important to not let the focus of the time take you away from the focus of riding the fences at the correct speed so you need to make a plan of when to look at your watch. If you had decided that the conditions were good, your horse is ready for it and you were going to compete for the optimum time it would be good to know where a halfway point on the course is which will give you an indication on whether or not your speed is correct for the level you are competing at. This can be doing using a measuring wheel although most people will use some sort of GPS device or phone app to measure the track. Make sure the place you plan to check your watch is on a galloping area that doesn’t require and other instructions to the horse so not to lose your focus on the course. There are two ways of using most timing devices….. This is when you start your watch at zero and press START when leaving the start box (ideally 5 seconds before). The advantage of this method is that most watches will beep on each minute which will give you a basic indication of which areas you are slower, ie, some riders will naturally be slower in the first minute and then often speed up unnecessarily towards the end. Using this method would be more educational for an amateur rider to start to feel and learn about speed. The only drawback is that the minute beeps may come when you’re in the middle of a combination and could be off putting if the rider allowed it. This is where you set the optimum time into your watch prior to leaving the start box (+ 5 seconds). The time will run down and at any place around the course it will give you your remaining time. If you go over your optimum time it will start counting back up with most models beeping at the same time. This can be extremely off putting and cause the rider to ride unnecessarily fast towards the end of the course, often taking risks at fences that need more preparation. At a 3day event the XC fences are more spread out with often big galloping spaces between. Measuring the minute markers prior to riding will help you ride accurately to the optimum time. When you walk take into account the ‘fast minutes’ ie, the ones that maybe just have fences with softer profiles or single fences and also take into consideration the minutes that may take much longer ie, contain combination fences, water, long routes, etc. You can then work a plan of riding the track much more accurately so not to over tire your horse for the third day. At a national or CIC event the fences on the XC will be relatively close together so using minute markers should only be used a basic guide to help a rider understand where maybe the time is being wasted.